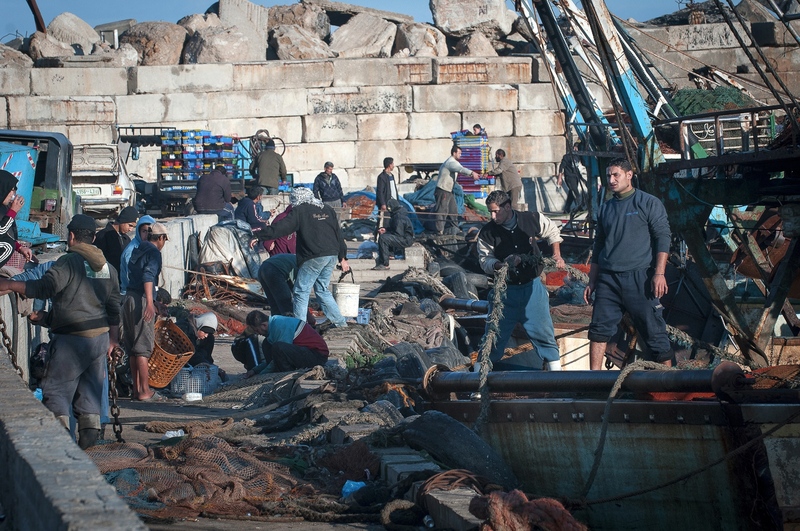 Fishermen making ready their boats. Early morning at Gaza sea port, Gaza City, Gaza Strip. 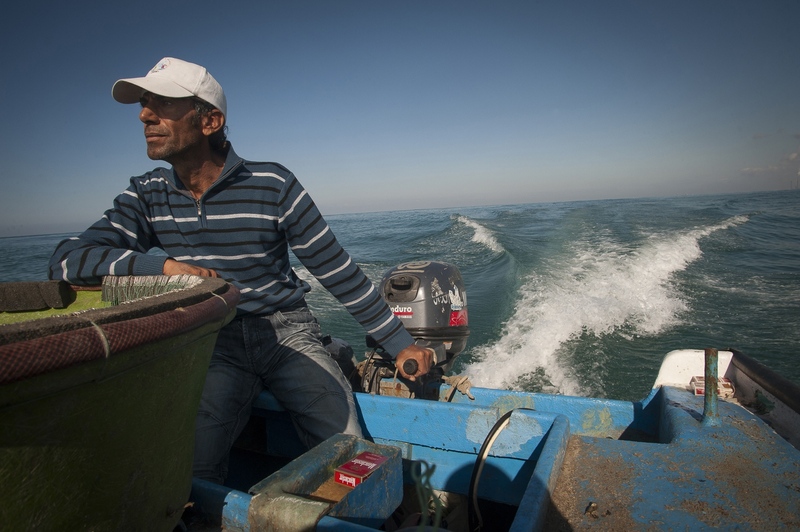 Abou Yasser steers his 'line' boat at 3 kilometers out from the Gazan coast: "At 5 kilometers your life is in danger with the constant battle with the Israelis"
Mohamad Miqdud starts hooking the bait onto the 750 hooks onboard their line boat: "I think i've not just done this millions of times but billions." he comments when asked about his work. 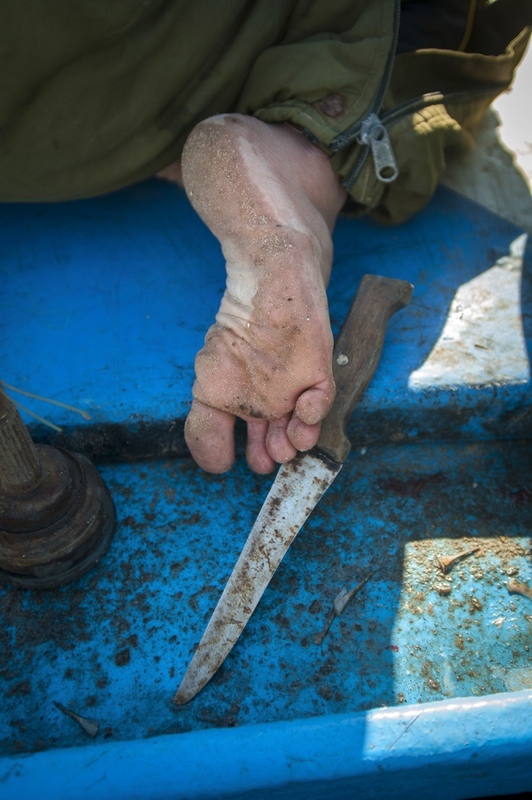 Meager findings off the coast of Gaza for fishermen Abou Yasser and his cousin Mohamad Miqdad. No shoes for more grip on board their line boat for 28 year old Mohamad Miqdad. Life long Fisherman 89 year old Rajab Hessi in discussion at Gaza Port Gaza, Gaza City, Gaza Strip. "When i was young we could fish everywhere. there were no restrictions'. Line boat fishing off the Gazan coast. 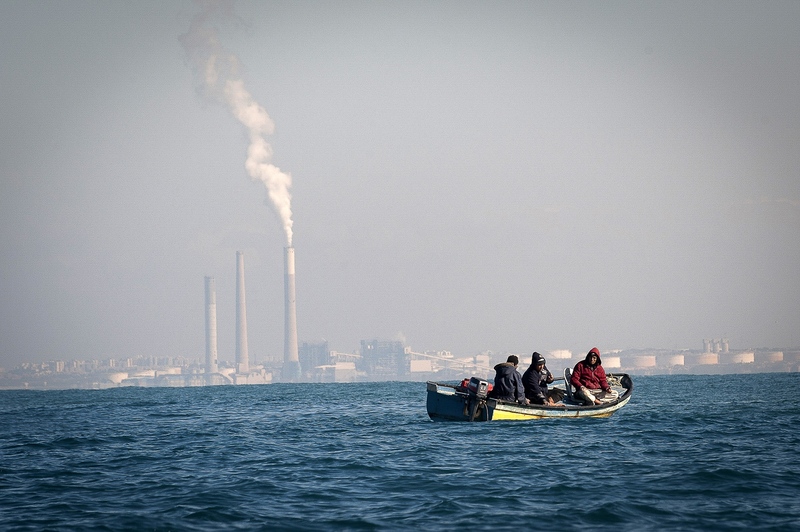 The chimney stacks behind the line boat are in Israel. 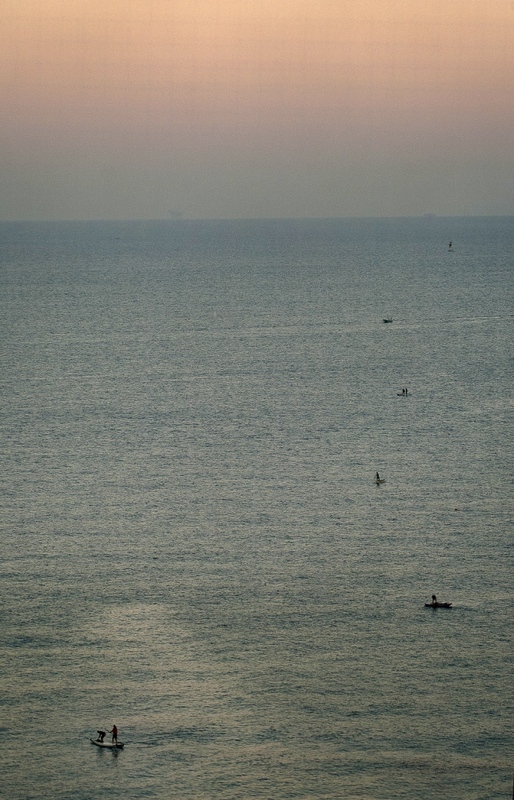 Line fishing boats in the early morning off the coast of Gaza. 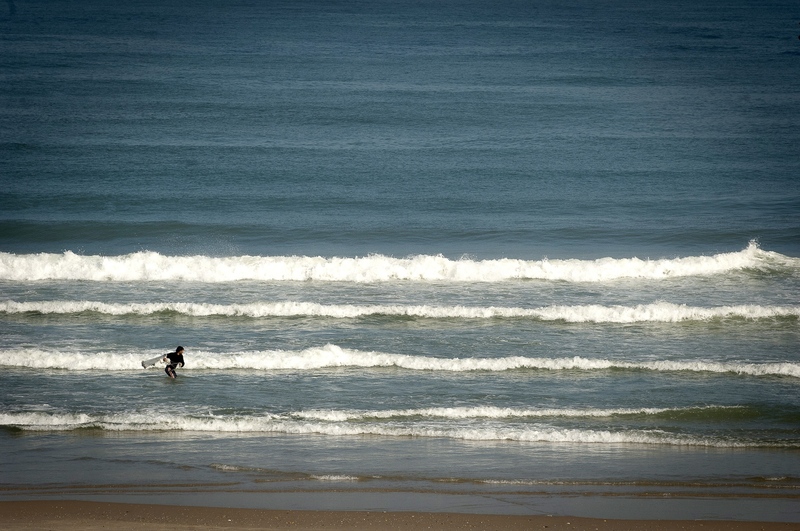 Fisherman on the beach in Gaza City. 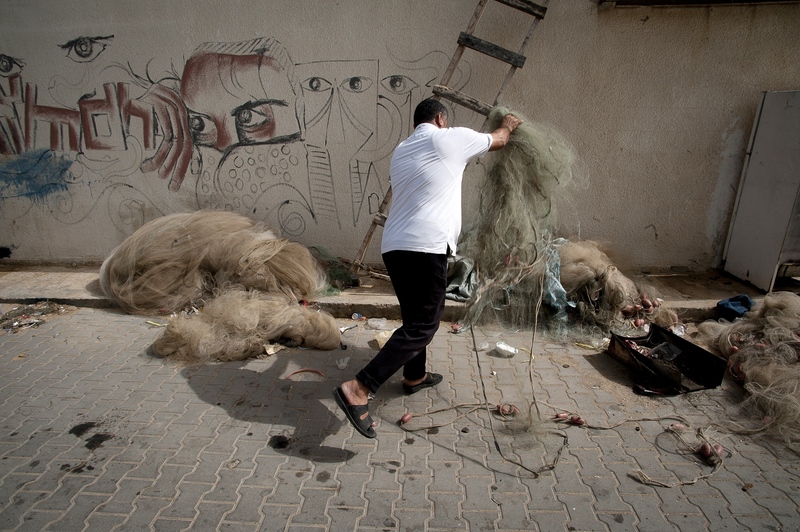 Nasser Abu Emeira throwing away broken nets outside his fishing shed at Gaza Port, Gaza Strip. 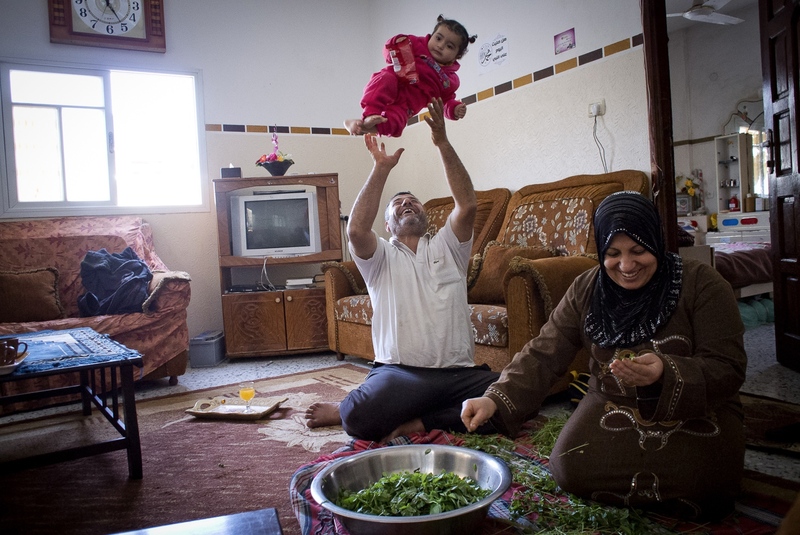 Nasser Abu Emeira at home with his wife and grand daughter preparing dinner in Beach Camp, Gaza City, Gaza Strip. 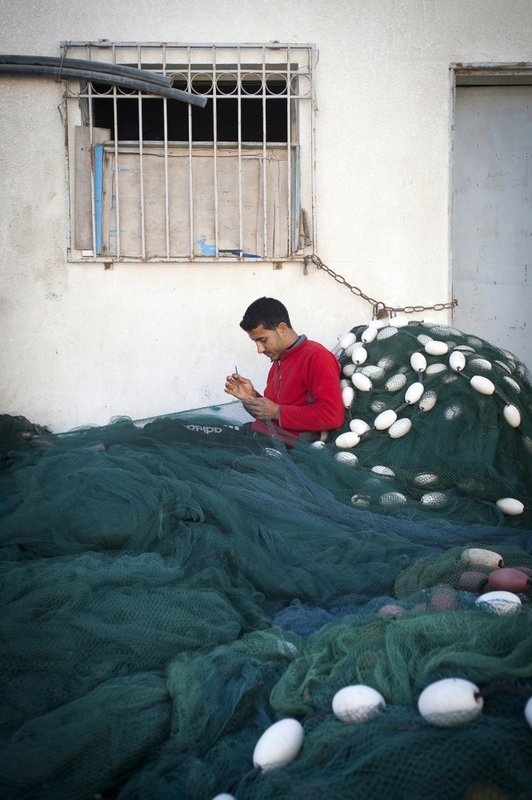 24 eyar old Achmed Abu Emeira mending fishing nets at Gaza Port, Gaza Strip, occupied Palestinian territories. 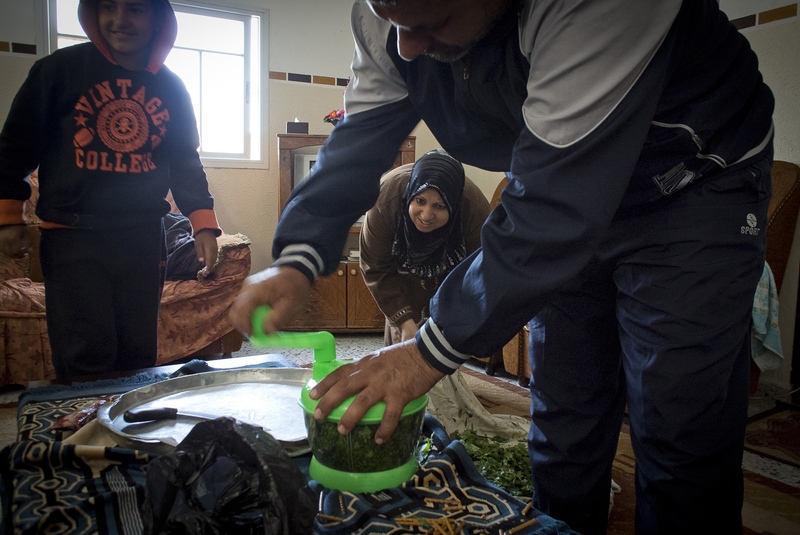 Nasser Abu Emeira at home with his son Mohammed and wife preparing dinner in Beach Camp, Gaza City, Gaza Strip. 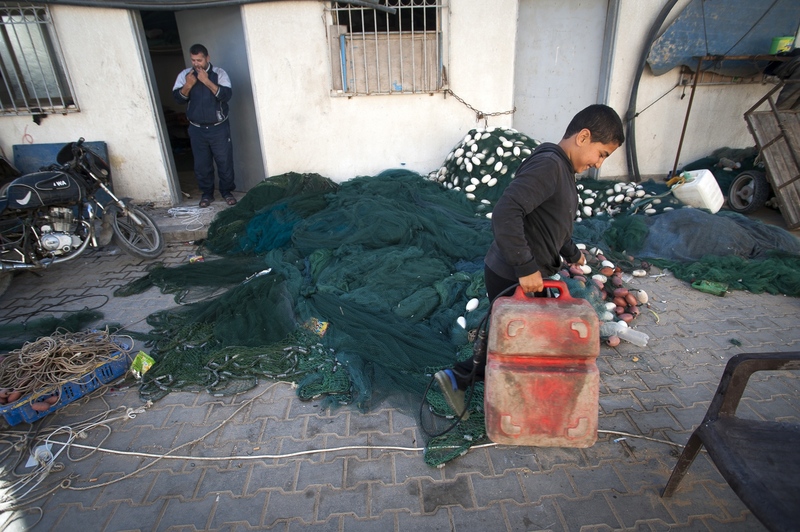 12 year old Mohammed Abu Emeira carries the Diesel from the family office at Gaza Port to their boat in harbour. 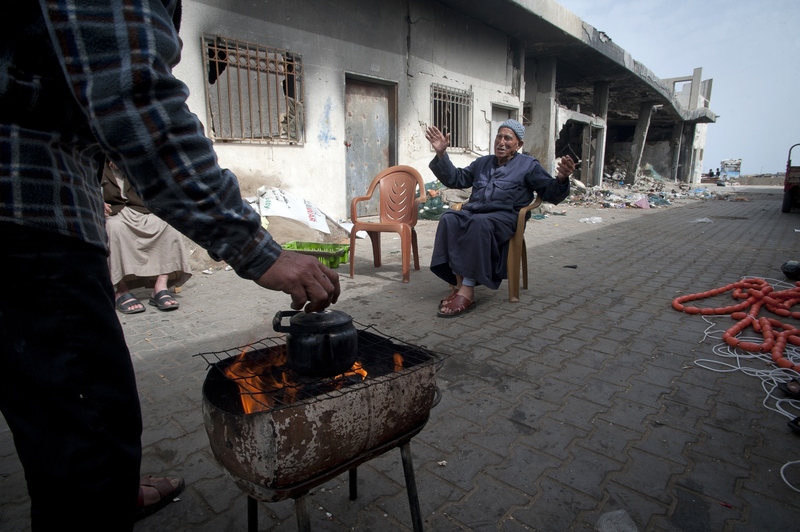 Gaza Port, Gaza Strip, occupied Palestinian territories. 12 year old Mohammed Abu Emeira boards ship at Gaza Port, Gaza Strip, occupied Palestinian territories. 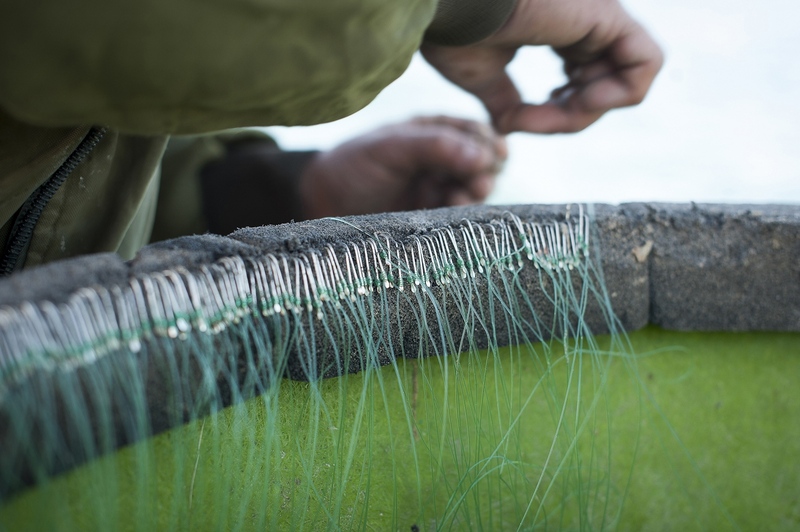 47 year old Gaza Fisherman Nasser Abu Emeira checking his fishing nets while in Gaza Port, Gaza Strip, occupied Palestinian territories. 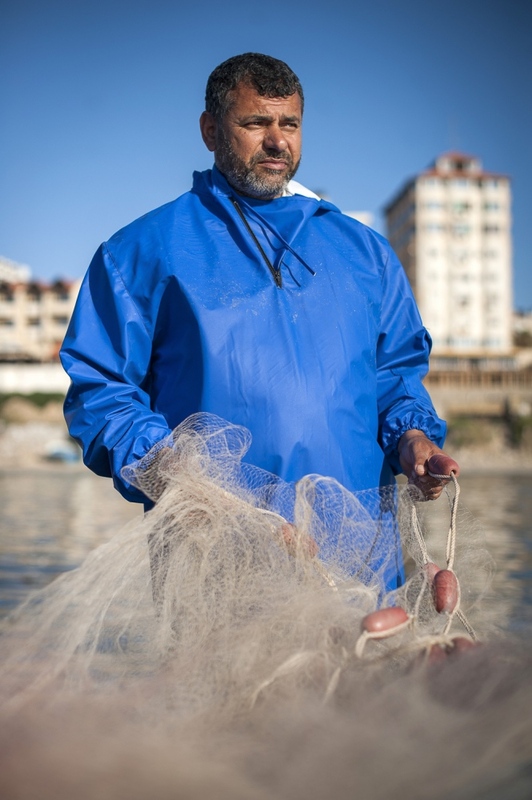 In 2000 the United Nations estimated there were 10,000 fishermen working with in the Gaza Strip by July 2013 in was recorded as 3,500. 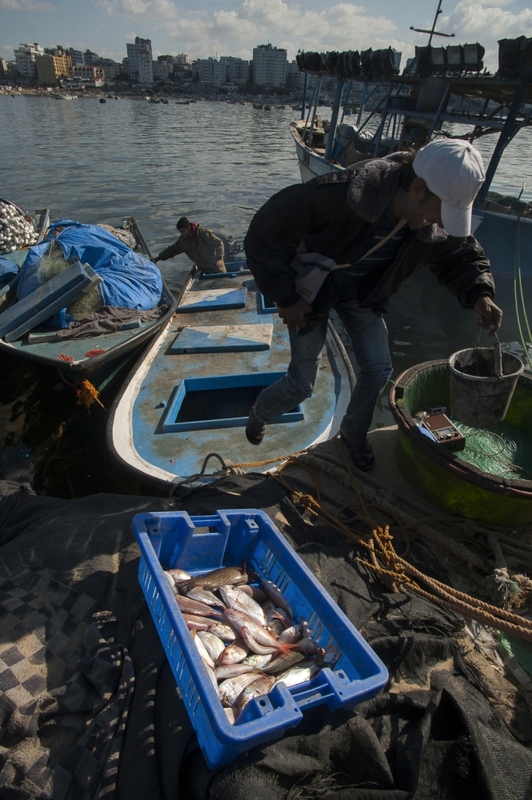 The plight of Gaza’s fishing industry is a story of a continual decline not attributable to a lack of fish in the sea but restrictions imposed on the distance the fishermen can travel from Gaza’s shore line to fish the best waters. 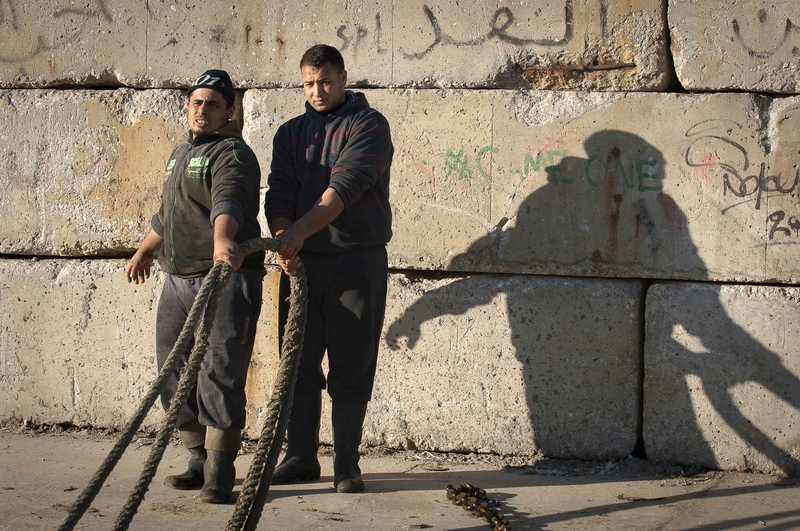 Fishermen have fallen from, in there own words, being some of Gaza’s richest citizens to a position calculated by the United Nations where 90% of them are now dependent on international aid. The internationally recognised limit of territorial fishing waters is 12 nautical miles. 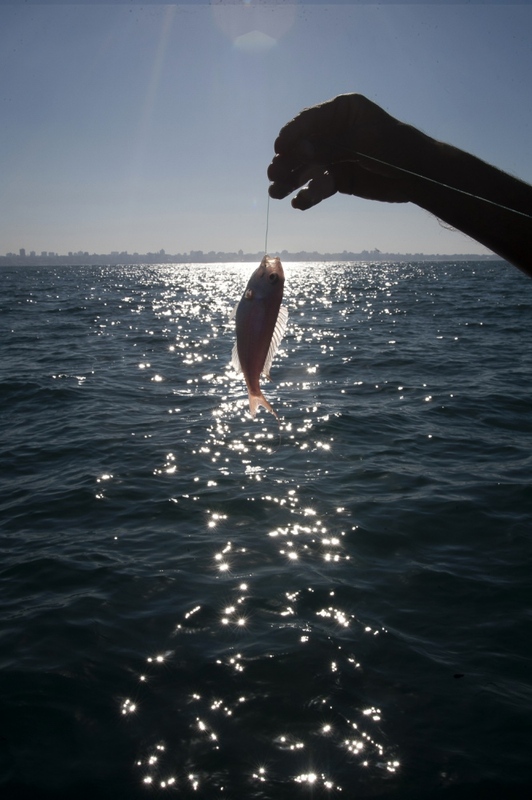 However, the distances the Gaza fishing fleet can travel have become a political football and seen by Palestinians as further evidence of a collective form of punishment imposed on them within the Gaza Strip. 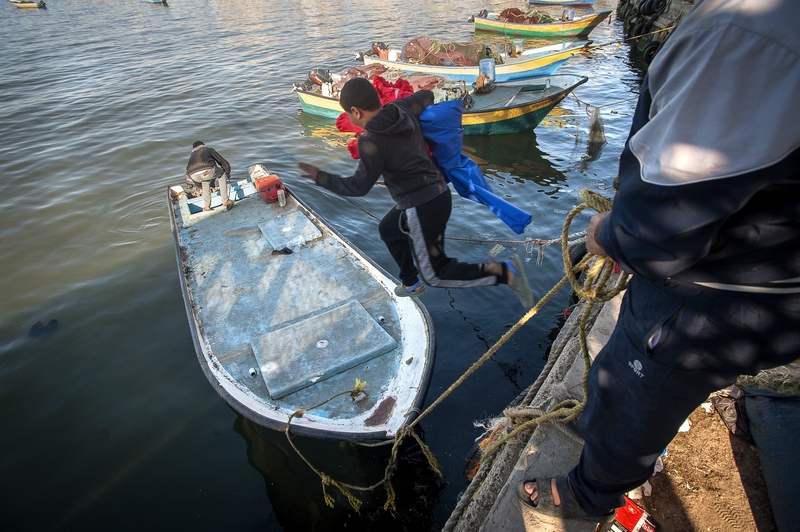 Fishermen’s lives have been lost and boats and nets impounded in a continual game of cat and mouse with the Israeli navy as it enforces the nautical limits it is deemed they are allowed to fish within. The recent cease-fire brokered to end the 51 days of Israel’s ‘Operation Protective Edge’ is supposed to enshrine the Palestinian fishing fleet’s operating from Gaza the right to travel to 12 nautical miles. So far 6 miles has been intermittently permitted but as yet there is no sign of the agreed gradual extension to 12 nautical miles where the best fish stocks linger. Indeed the reverse now seems to be being imposed and the fishing distance once again is shrinking.